Captain Carter has vivid dreams and memories as seen through the eyes of Jolinar, the Tok'ra who had briefly inhabited her body. Despite the progression of her father's cancer, Carter joins the mission to P34-353J to seek out the Tok'ra. There SG-1 meets the Tok'ra leaders, including Martouf, who had been Jolinar's mate, and they learn much about the ways of the resistance group. But trust is fragile, and the Tok'ra are unwilling to form an alliance. In fact, when word arrives that Jacob Carter's condition is critical, the Tok'ra refuse to permit SG-1 to return home. Part one of two. In part two, the Tok'ra see little advantage in an alliance with Earth. What they need most are hosts. However, Carter's father, General Jacob Carter, is dying of cancer, and he is willing to act as a host for Selmak, a Tok'ra leader who is dying, in order to save both his life and Selmak's. As he is brought to the planet, the Goa'uld attack the base. O'Neill helps to identify Cordesh as the Goa'uld spy who tipped off the enemy, but the Tok'ra must complete the blending of Jacob and Selmak and evacuate the base before they are destroyed by the Goa'uld. "Tok'ra" means "Against Ra." 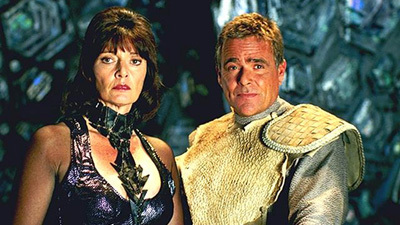 According to Jaffa legend, the Tok'ra are Goa'uld resistance, their stated goal being the dstruction of the System Lords and a change in the ways of the Empire. They are despised and hunted by the Goa'uld and must continually flee to new planets. When they arrive on a planet, they go deep underground and use technology to plant crystals and grow tunnels, similar to a geode. When they move on, the tunnels are destroyed. The Tok'ra are infiltrators. They had operatives who died aboard Apophis' ships during the attack on Earth. Grand Counsel Garshaw of Belote is the most hunted Goa'uld of all time. The Tok'ra do not take hosts by force. The symbiote blends with a host by choice, resulting in a truly symbiotic relationship. The symbiote and host share a body, knowledge, and feelings. The life span is double that of a human, but they do not use a sarcophagus to extend life further. Thus they have zero to negative population growth. Symbiotes do not have a gender, but take on the gender of the host. Jolinar had always been in female hosts, and was the mate of Martouf/Lantash for over 100 years. Tok'ra enter through the throat rather than through the back of the neck. Goa'uld prefer the back of the neck because they do not wish to remember the horror on the face of the host when they see their own reflection. A Tok'ra symbiote can cure many diseases within a human host, including cancer and arthritis. Tok'ra can leave a host's body without harming it, and can jump from one host to another in order to hide. Lantash is the symbiote within the host body of Martouf. Garshaw is the symbiote within the host body of Yosuuf. Selmak is the symbiote within the host body of Saroosh. Jolinar was the symbiote within the host body of Rosha. The System Lords dispatched two mother ships to attack the Tok'ra planet. Jacob Carter's lymphoma had spread to his liver, and he was admited to the USAF Academy Hospital, not expected to live much longer. SG-3, under Colonel Makepeace, was sent to extract Carter to return to Earth. Jacob Carter will act as liason between Earth and the Tok'ra. The Tok'ra were given a Sagan box to contact Earth. Carter's IDC code is 1631293. Where's that yellow brick road when you need it, eh, Dorothy?